The people spoke and I listened. My poll to choose the meal with which I would break my fast garnered almost 100 votes. The winner by 13 percentage points was the homemade vegetable soup. After looking at a handful of recipes online (and not writing anything down! ), I had a fantastic time gathering ingredients and cooking. I started early in the evening when the soup had a comfortable lead in the poll. It narrowed somewhat, but was never seriously challenged. Because of the large red beet, the broth and many of the vegetables end up tinted a bright red. I can picture this served in green, decorative bowls and being a beautiful and delicious appetizer for a fancy Christmas dinner. My recipe is entitled “Mike’s Red Everything Soup” and I am slowing devouring a small bowl of it as I write this post. It is the best vegetable soup I have ever tasted. (So says a starving man.) I used pretty much every vegetable I could find in our pantry or fridge. Ingredients: Notes: 1. None of the vegetables were peeled, just scrubbed thoroughly. 2. All sizes and measurements are approximate. In other words – I guessed at most everything! 1. Combine water, beets, potatoes, carrots, zucchini, the bouillon cubes, Worcestershire sauce, and all of the spices in a large pot, bring to a boil and allow to simmer for as long as you want, (but at least 45 min to 1 hour). 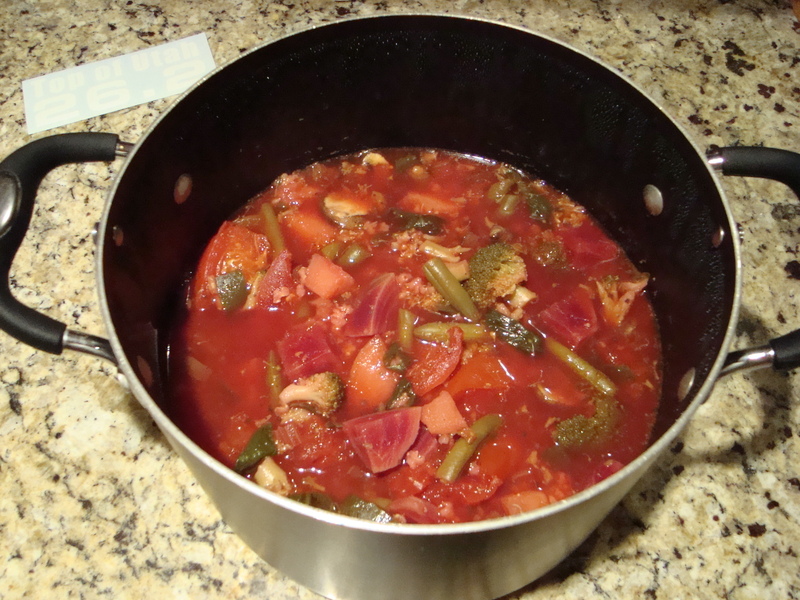 I cooked this soup for a total of three plus hours, so that all the vegetables would be soft and easy to digest. This what you want coming off of a fast. You may want to adjust the cooking times to suit your taste. 3. Add all remaining ingredients and simmer for another 1/2 hour to 45 minutes. This should serve 8-12 people with some left over. That is unless everyone comes back for seconds!